Last week, Grace the Swan completed her 127 mile journey along the Leeds Liverpool canal, with BBC Radio Leeds presenters Adam pope and Katherine Hannah at the helm. The team were welcomed into Granary Wharf by regional news crews and hundreds of supporters. 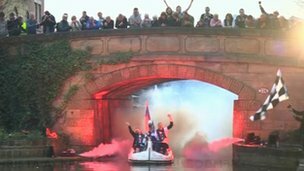 In all, the Sport Relief pedalo challenge raised over £50,000 for charity. Massive well done to the BBC team, Alison, Adam and Hannah, the Swandeliers who helped out now and then along the way, and of course, Grace herself. The test drive of Grace in Leeds was not without its problems – she sprung a leak! Some quick thinking and decisive action from John and co saved her feathers. It seems its back to the garage for Grace for some tlc and fibreglass.